The tobacco giant is pushing Marlboros in colorful ads at kiosks and handing out free smokes at parties frequented by young adults – tactics that break India’s anti-smoking laws, government officials say. Internal documents uncovered by Reuters illuminate the strategy. S. K. Arora spent more than three years trudging through the Indian summer heat and monsoon rains to inspect tobacco kiosks across this sprawling megacity, tearing down cigarette advertisements and handing out fines to store owners for putting them up. But as fast as he removed the colorful ads, more appeared. The chief tobacco control officer at the Delhi state government, Arora asked the major cigarette companies to put a stop to the cat-and-mouse routine. In official letters and face-to-face meetings, he told them India’s tobacco control laws barred such public advertising and promotion of cigarettes. That included the Indian arm of Philip Morris International Inc, the world’s largest publicly traded tobacco company. Early last year, Arora said, he met with a Philip Morris director for corporate affairs in India, a man named R. Venkatesh, and told him the signs were an unequivocal violation of Indian law. Like other tobacco companies, Philip Morris kept up its ad blitz. Venkatesh says Philip Morris is doing nothing wrong. In response to questions from Reuters, he said the company’s advertising is “compliant with Indian law” and that Philip Morris has “fully cooperated with the enforcement authorities” on the matter. But Indian government officials say Philip Morris is using methods that flout the nation’s tobacco-control regulations. These include tobacco shop displays as well as the free distribution of Marlboro – the world’s best-selling cigarette brand – at nightclubs and bars frequented by young people. 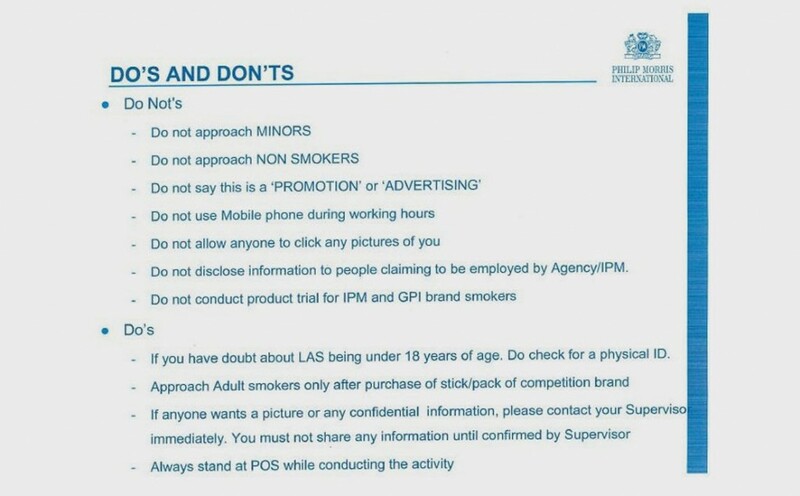 In internal documents, Philip Morris International is explicit about targeting the country’s youth. 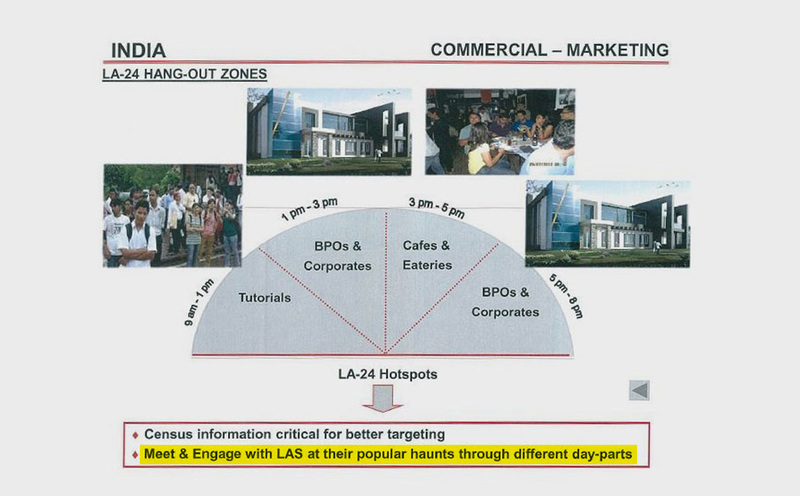 A key goal is “winning the hearts and minds of LA-24,” those between legal age, 18, and 24, according to one slide in a 2015 commercial review presentation. 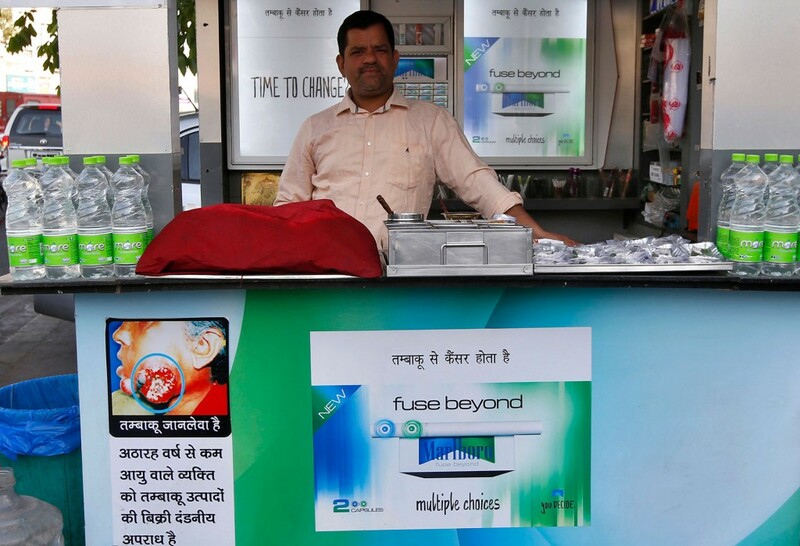 As with the point-of-sale ads at kiosks, public health officials say that giving away cigarettes is a violation of India’s Cigarettes and Other Tobacco Products Act and its accompanying rules. Philip Morris’ marketing strategy for India, which relies heavily on kiosk advertising and social events, is laid out in hundreds of pages of internal documents reviewed by Reuters that cover the period from 2009 to 2016. In them, Philip Morris presents these promotions as key marketing activities. In recent years, they have helped to more than quadruple Marlboro’s market share in India, where the company is battling to expand its reach in the face of an entrenched local giant. Reuters is publishing a selection of those documents in a searchable repository, The Philip Morris Files. The company’s goal is to make sure that “every adult Indian smoker should be able to buy Marlboro within walking distance,” according to another 2015 strategy document. With cigarette sales declining in many countries, Philip Morris has identified India, population 1.3 billion, as a market with opportunity for significant growth. “India remains a high potential market with huge upside with cigarette market still in infancy,” says a 2014 internal document. According to government data, India has about 100 million smokers. Of those, about two-thirds smoke traditional hand-rolled cigarettes. Tobacco use kills more than 900,000 people a year in India, and the World Health Organization estimates that tobacco-related diseases cost the country about $16 billion annually. Philip Morris is not alone in using marketing methods that Indian officials say are illegal. The country’s largest cigarette maker, ITC Ltd, uses similar tactics, such as advertising at kiosks. British American Tobacco Plc and Indian state-run companies have large, passive stakes in ITC, which controls about 80 percent of the market. 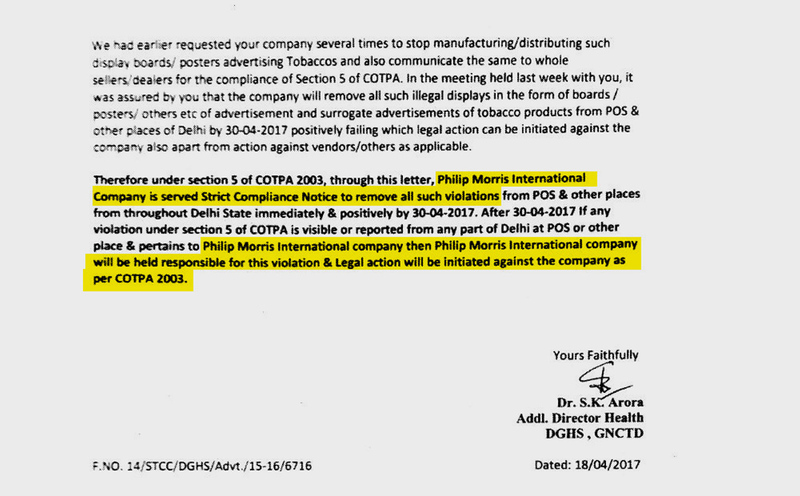 Tobacco-control officer Arora, a short, mustachioed man with a gruff demeanor, sent a letter to Philip Morris and other tobacco companies in mid-April, giving them until the end of the month to remove all advertisements. “Legal action will be initiated against the company” if it did not comply, he wrote in the letters, copies of which were reviewed by Reuters. A day after Arora’s deadline passed, he and his team conducted a raid in an affluent area of cafes and coffee shops in New Delhi that showed his letters did not have the desired effect. On that hot afternoon in May, the team cut down about a dozen advertisements for Marlboro and various ITC brands. As word of the raid spread, worried vendors covered their ads with newspapers or took them down. One kiosk owner, Rakesh Kumar Jain, removed his Marlboro ads before Arora’s team arrived. Jain said the signs had been put up by Philip Morris representatives. In return, he said, he received free cigarettes each month worth about 2,000 rupees (about $30). Jain knew that putting up the posters was illegal, but they helped improve sales, he said. About a dozen kiosk owners interviewed by Reuters said that tobacco companies paid them a monthly fee for advertisements and product displays, with the amount determined by factors such as location, volume of business and type of promotional material. In payment receipts seen by Reuters, Philip Morris’ India unit promised to pay 500 Indian rupees ($7.50) a month to a cigarette seller with a small roadside kiosk in New Delhi for putting up Marlboro ads. The receipts were signed by a company representative. During the raid, fines were issued to some vendors, many of them repeat offenders, and they were threatened with court action if the ads went up again. Since Arora’s threat of legal action in April, there are fewer Philip Morris advertisements outside cigarette shops in the capital. But both Philip Morris and ITC say that advertising inside a shop is allowed. “Advertisements of tobacco products at the entrance and inside the shops selling tobacco products are clearly and categorically permitted,” ITC said in response to questions from Reuters. Arora, however, said all advertising is prohibited – “There are no two ways about it,” he insisted – but he can’t start legal proceedings until getting further guidance from the federal government. He has yet to receive an answer. Federal health officials say in interviews that the ads are out of bounds. Amal Pusp, a director for tobacco control at the health ministry, told Reuters that “there is no confusion”: All advertisements – inside and outside shops – are illegal. 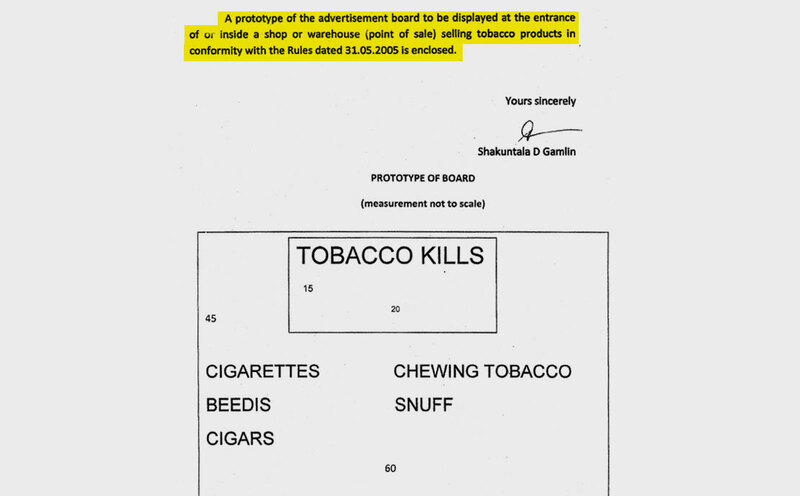 The 2003 law allows tobacco companies to advertise at shops, but subsequent rules issued by the government prohibit it. In 2004, India became one of the first countries to ratify the World Health Organization’s Framework Convention on Tobacco Control (FCTC) treaty. The pact has 181 members and contains a raft of anti-smoking provisions, including tobacco taxes, warning labels on cigarette packs and advertising bans. The country enacted its national tobacco control law the year before ratifying the FCTC, and since then the government has added rules to strengthen the law in line with the treaty’s provisions. The health ministry published rules in 2005 that banned any display of brand names, pack images or promotional messages. The rule specified that tobacco retailers could only display a 60-by-45 centimeter board, roughly 24 by 18 inches. The sign can have a description of the type of tobacco products sold – such as cigarettes or chewing tobacco – but cannot include any brand advertising and must carry a large health warning. The health ministry’s rules were challenged in court by a group of cigarette distributors and put on hold by a state-level High Court for seven years. They finally came into force in 2013 on orders of India’s Supreme Court. The High Court had overlooked the fact that advertisement of tobacco products “will attract younger generation and innocent minds, who are not aware of grave and adverse consequences of consuming such products,” the Supreme Court said in its ruling. Philip Morris has lobbied against the passing of stricter tobacco control rules by the Indian government. In documents detailing the company’s plans for the biennial FCTC treaty convention in India last November, Prime Minister Narendra Modi emerges as a prime target. 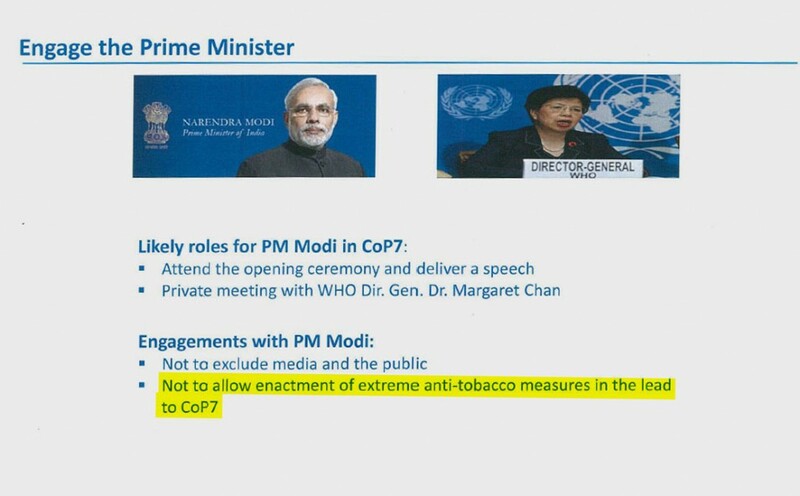 A key goal: to pre-empt Modi from taking “extreme anti-tobacco measures” before delegates were to gather from around the world for the treaty meeting, according to a 2014 corporate affairs PowerPoint presentation. 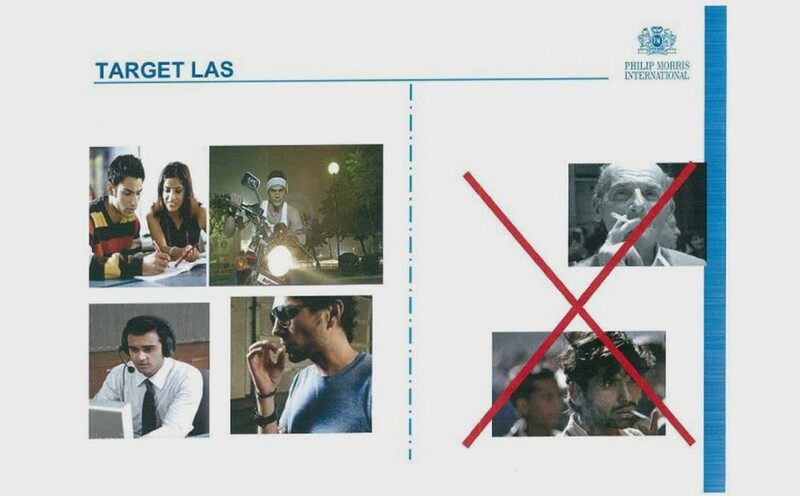 A slide from a Philip Morris training manual shows the kinds of people the company aims to target for Marlboro sales in India. LAS = legal age smokers. 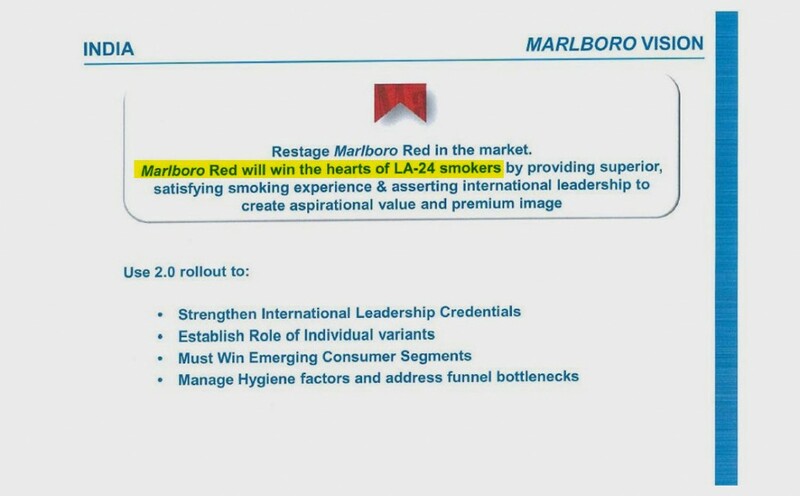 A slide from a 2014 strategy presentation shows Philip Morris’ goals for marketing Marlboro Red in India. LA-24 = legal age to 24-year-old smokers. This slide from a 2012 marketing presentation shows where Philip Morris planned to target 18-to-24-year-old smokers in India. A Philip Morris training manual lays out rules for how those marketing its cigarettes should look. 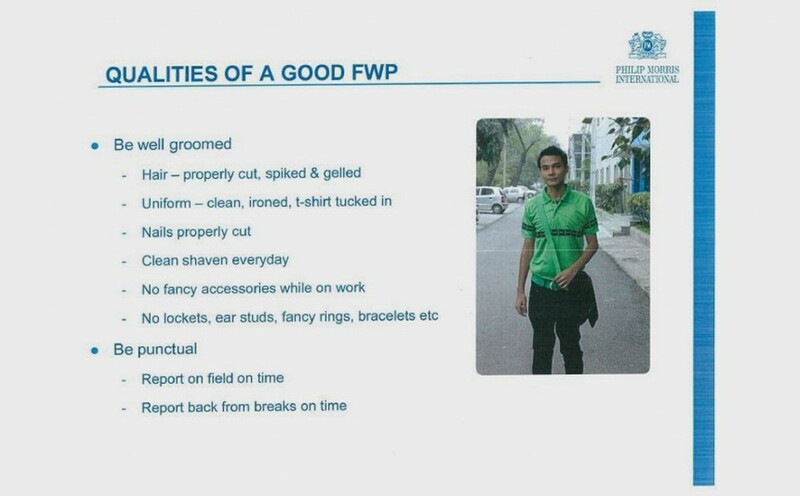 FWP = field work personnel. Kiosk owners in Delhi say that Philip Morris pays them a monthly fee to put up its advertisements. Names have been redacted on this Philip Morris receipt. 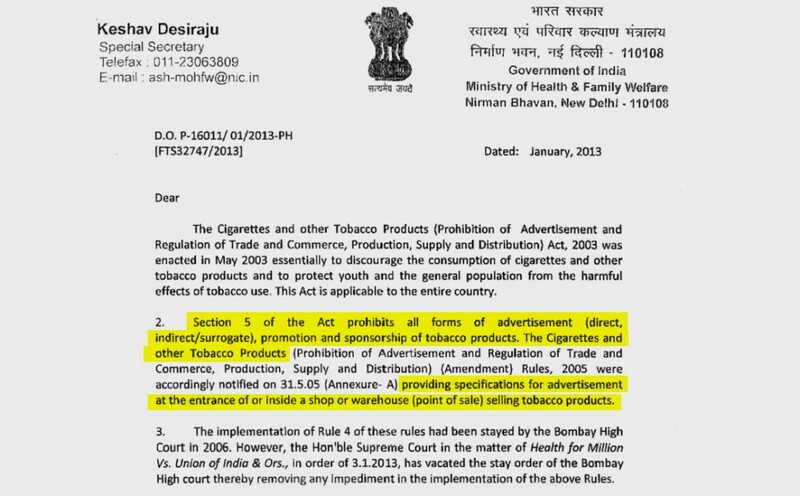 Keshav Desiraju, then a senior health ministry official, wrote to state governments in January 2013, instructing them to stop all tobacco advertisements. In April, S.K. Arora, the chief tobacco control officer in Delhi, warned Philip Morris International in a letter that it could face legal action over its advertising. 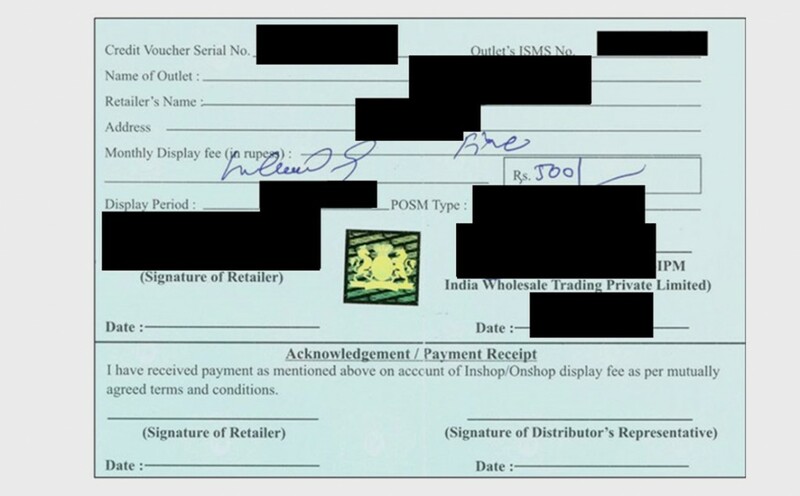 An excerpt from a 2013 letter from a health ministry official to state governments shows specifications for the board that can be displayed at shops selling tobacco products. According to Indian law, the board cannot include any brand names. Beedis are traditional hand-rolled cigarettes. Ahead of the World Health Organization’s global tobacco control treaty meeting in India last November, Philip Morris planned to engage Prime Minister Narendra Modi in an effort to head off new anti-tobacco measures. The slide is from a 2014 corporate affairs document. CoP7 = Conference of the Parties, the biennial treaty meeting. The company planned to gain Modi’s ear through those close to him. It identified several people in this group, including Commerce Minister Nirmala Sitharaman, Health Minister Jagat Prakash Nadda, and Amit Shah, president of the ruling Bharatiya Janata Party. Modi and the other politicians didn’t respond to requests for comment. Philip Morris International also didn’t comment on the plan. The tobacco giant’s efforts to fend off anti-smoking steps have had limited impact so far. Last year, for instance, India ordered manufacturers to cover 85 percent of the surface of cigarette packs with health warnings, up from 20 percent. The rule, which is still being challenged in a state court by the tobacco industry, including Philip Morris’ India partner, was implemented by order of the Supreme Court. Marlboro has just a 1.4 percent share of the almost $10 billion cigarette market in India. The industry is dominated by ITC, which has a strong grip on distributors and retailers. One major method Philip Morris is deploying to gain ground, the marketing documents show, is the free distribution of cigarettes at bars and nightclubs – known as Legal Age Meeting Points, or LAMPs, in company jargon. The hiring of young women and men to work at these gatherings is outsourced to event management companies, according to people with knowledge of the gatherings. Some of the recruiting takes place online. “Hey girls…We are searching A++ Hot & Gorgeous girls for the Marlboro pub activity…Pay: 2000/day…Work: Promotion in clubs in Delhi,” read one post on a Facebook public group in June last year. There was no company name attached to the ad. At the parties in India, people who took the Marlboro packs were asked their names, ages and preferred brands. Philip Morris calls this distribution of free cigarettes “sampling,” which it says in an internal document is allowed under the law. The company has spent millions of dollars on these activities. In 2014, for example, Philip Morris estimated it spent $1.6 million on LAMP events and sampling at kiosks in India, according to the 2015 commercial review presentation. The company planned to use LAMPs in 2015 to generate 30,000 “trials,” or samplings of cigarettes. And it planned to generate another 500,000 trials that year through sampling at cigarette shops and kiosks, according to the 2015 strategy document. Indian health ministry officials say that anyone who hands out free cigarettes, whatever the circumstances, is breaking the law. The Health Ministry’s Amal Pusp says the law against distribution of free cigarettes is unambiguous. He cites Section 5 of the country’s tobacco control act, which says: “No person, shall, under a contract or otherwise promote or agree to promote the use or consumption of” cigarettes or any other tobacco product. The law carries a fine of up to 1,000 rupees (about $15) and a sentence of up to two years in prison for a first conviction. “We believe we market our products in a responsible manner, and in compliance with Indian regulations,” Philip Morris’ Venkatesh said, without elaborating. In October last year, the month before India was due to host delegations from around the world at the biennial FCTC tobacco control conference in Delhi, tobacco-control officer Arora said he suddenly started getting traction. The cigarette ads vanished and Delhi was “cleaned,” he said. That success couldn’t have come at a better time for Arora and his colleagues at the federal health ministry: They wanted to make sure foreign delegates visiting India saw the country was serious about its tobacco regulations. Weeks after the FCTC delegates left town in November, however, kiosks in the capital were again displaying ads for Marlboro. Additional reporting by Aditi Shah in New Delhi, and Abhirup Roy and Swati Bhat in Mumbai. After a one-year grace period, the ban on displaying cigarettes and other tobacco products in stores will take effect on Aug 1, the Ministry of Health (MOH) reminded in a news release on Tuesday (Jul 18). Retailers must keep the tobacco products in plain, undecorated storage devices, and out of customers’ direct line of sight. Laws to ban the display of tobacco products were passed in Parliament last March, under amendments to the Tobacco (Control of Advertisements and Sale) Bill. It is part of MOH’s efforts to discourage smoking, particularly among younger people in Singapore. Under the regulations, the point of sale will remain fixed at the cashier, to reduce the accessibility of cigarettes to youths and non-smokers. In addition, a text-only price list based on a template prescribed by MOH may be shown to customers only at their request. Retailers convicted of flouting the ban face a maximum jail term of six months, a fine of up to S$10,000, or both. The penalties are double for repeat offenders. We want to believe we’re raising our kids to think for themselves, and not to do dumb or unhealthy things just because the cool kids are doing them. But research shows that when it comes to smoking, children are heavily influenced by some of the folks they consider the coolest of the cool: actors in movies. “There’s a dose-response relationship: The more smoking kids see onscreen, the more likely they are to smoke,” said Dr. Stanton Glantz, a professor and director of the University of California, San Francisco, Center for Tobacco Control Research and Education. He is one of the authors of a new study that found that popular movies are showing more tobacco use onscreen. He said that epidemiological studies have shown that if you control for all the other risk factors of smoking (whether parents smoke, attitudes toward risk taking, socioeconomic status, and so on), younger adolescents who are more heavily exposed to smoking on film are two to three times as likely to start smoking, compared with the kids who are more lightly exposed. Those whose parents smoke are more likely to smoke, he said, but exposure to smoking in movies can overcome the benefit of having nonsmoking parents. In one study, the children of nonsmoking parents with heavy exposure to movie smoking were as likely to smoke as the children of smoking parents with heavy movie exposure. To Dr. Glantz, and the other people who study this topic, that makes smoking in movies an “environmental toxin,” a factor endangering children. “There’s no excuse for continuing to have smoking in movies that are rated to be sold to kids, and so the policy objective we have is there should be no smoking in movies that are rated for kids,” said Dr. Glantz, who maintains a website called Smoke Free Movies. “The studios have it in their power to fix this with a phone call.” The rating system needs to start treating smoking like a proscribed obscenity, he said; if it’s in the movie, the movie gets an R rating. The Centers for Disease Control and Prevention’s fact sheet on smoking in the movies estimates that taking smoking out of films rated for children would save 18 percent of the 5.6 million young people alive today who will otherwise die of tobacco-related diseases – a million lives. “There’s nothing you could do that would be so cheap and save so many lives,” Dr. Glantz said. But after 2010, despite the accumulating evidence, the rate of cinematic smoking started to rise in those youth-rated movies, according to the new study, published this month in the C.D.C.’s Morbidity and Mortality Weekly Report, which looked at incidents of tobacco use in top-grossing movies from 2010 to 2016. As far as movies rated G, PG, and PG-13, “When we compared 2010 to 2016, there was a slight decrease in the number of movies, but an increase in the number of incidents,” said Michael Tynan, a public health analyst in the office on smoking and health at the C.D.C., and the lead author of the new study. Dr. Glantz is also an author, and he and two of the four other authors have received grants from the Truth Initiative, an antismoking group. In a study done back in the ’90s, researchers pointed to some of the differences between who smokes on screen and who smokes in the real world. In the real world, smokers are likely to be “poor people, people with mental illness,” Dr. Glantz said. “If you look at the power players, the rich people, people who are in control, they’re not smoking.” But in movies, it tends to be more desirable or powerful characters, even if they’re the bad guys, and in that way, movie images may reinforce images in cigarette advertising. And movie images are powerful. In one experiment, young people who were smokers were shown montages of clips from recent movies; the participants were randomized so that some saw clips with smoking in them and some did not. Then they were given a 10-minute break, and the people who saw the smoking images were significantly more likely to smoke during the break than the smokers who had not seen the images. There is a wooden shed in the middle of Nairobi city centre, dark, full of fumes, crowded and deliberately built beside the public toilets. It feels like a place of shame. Jairus Masumba, Nairobi County’s deputy director of public health, calls it in jest the gazebo. It’s the public smoking place, created by his department. It is claustrophobic and filled with smoke, some of which drifts out through slats, but most of which hangs heavily in the fugged air inside. Those who enter have to be desperate – and they’re usually men. A 27-year-old woman, who comes from the south of Kenya, is a rarity. She is heavily made-up and stands in the doorway. She smokes seven to 10 cigarettes a day. “It’s bad for you, no?” she says several times, though she knows the answer. The men inside, barely visible as you enter because of the darkness and the fug, are smoking hard, standing up like a football crowd, all facing the same way though there is nothing to look at except the wooden slats of the far side of the shed. Music blares but nobody is dancing. They are grim faced, doing what they have to do. A young man, high probably on khat and cigarette in hand, chases some of the butts and the ash out with a broom, seeking money from the other smokers for cleaning up. He says he has a diploma in business marketing and another diploma in substance abuse counselling. At the door are two cigarette sellers, doing a busy trade. It’s rare for anyone to buy whole packets. Packs of cigarettes in Kenya are broken up and sold by vendors as single sticks. That makes them cheap for women, children and the poor, despite manufacturers being banned from producing packets of less than 10. One of the two sellers sitting passively inhaling smoke is a woman who taps a packet of 20 and shakes them deftly out, one at a time, exchanging them for small coins. Men buy one, sometimes a couple, sometimes three. They will not all be smoked here. The sellers sit at the large red wooden boxes, with open lids that become the display cabinet. Most popular and cheapest is Sportsman at 100 shillings a pack (75p, 97 cents) or 5 shillings (less than 4p, 5 cents) for a single. Smokers buy sweets too, to take away the smell of tobacco when the worker goes back to the office. The shed is vile, but few dare smoke even on the pavement outside in the cleaner air in the knowledge that the plain clothed official public health enforcers will be circling, ready to impose fines on anyone they catch. Nairobi city has got tough on smoking. The Kenyan government has banned advertising and marketing and smoking in public places, but it is up to the individual counties to interpret and enforce that and they all do it differently. Nairobi County has cracked down hard. Lighting up on the open street in the city centre can result in a stiff fine of 50,000 shillings (£374, $485) or even arrest. But it’s not so everywhere, or even outside of the city centre. Yusef, 58 and from Kenya’s second city, Mombasa, on the Indian Ocean coast, says people smoke openly in Mombasa. He has been smoking since the 1970s. His 28-year-old daughter died recently from colon cancer. That gives him a different perspective. “I’m more worried about GM foods,” he says. Nairobi’s Uhuru Park is just under the nose of the ministry of health and has two small designated open-air smoking areas. On a Saturday, young women who are not smoking are there laughing and chatting with the young men who are. It’s somewhere to hang out. Elsewhere in the park, the same snack stalls proliferate. After 5pm, when the official public health enforcement officers go home, vendors and smokers relax. Cigarettes are sold and smoked openly. Outside of the city centre, the restrictions do not appear to be enforced at all. In the High Ridge residential area, a predominantly Indian community, stall holders are grilling corn and frying cassava crisps on the street. Others run the small stalls selling sweets, biscuits, fizzy drinks and cigarettes, openly smoking themselves. People wander along the road with a cigarette between their fingers. A large lorry stops and a man jumps down to buy two sticks, lighting both and passing one to his fellow labourer before they unload. These stalls are common near schools. A recent report compiled by the Consumer Information Network, a campaigning Kenyan anti-tobacco organisation, with Johns Hopkins University in the US, found such stalls selling sweets and single cigarettes within yards of primary schools across the country. You won’t see an advert for Dunhill or Rothmans in Kenya. At least, nothing that looks like an advert. Advertising and promoting cigarettes has been banned. But everybody knows what the large red wooden boxes and red wooden display trays at stalls at the side of roads contain. Red is the colour of British American Tobacco (BAT). The words have been stripped off the red umbrellas that protect street vendors from the sun or patched over, but the colour is a tacit reminder of what they used to say and what is still sold there. BAT said its products were for adult smokers only and that it would much prefer that stalls sold whole packets rather than single sticks, “given our investment in the brands and the fact there are clear health warnings on the packs. “Across the world, we have very strict rules regarding not selling our products to retailers located near schools. BAT Kenya provides support to many of these independent vendors, including providing stalls painted in non-corporate colours, and providing youth smoking prevention and health warnings messages. We also educate vendors to ensure they do not sell tobacco products near schools. Pictures and video by David Levene. Multimedia editing by Ekaterina Ochagavia. This content is funded by support provided, in part, by Vital Strategies with funding by Bloomberg Philanthropies. Content is editorially independent and its purpose is to shine a light on both the tobacco industry and the world’s most vulnerable populations, who disproportionately bear the brunt of the global health crisis resulting from tobacco consumption. Although tobacco consumption remains one of the world’s greatest health threats, media coverage has decreased as the sense of urgency to address the issue has waned. This investigative reporting series seeks to renew the focus on tobacco consumption and deaths worldwide, contextualised through the duel lenses of global inequality and health. All our journalism follows GNM’s published editorial code. The Guardian is committed to open journalism, recognising that the best understanding of the world is achieved when we collaborate, share knowledge, encourage debate, welcome challenge and harness the expertise of specialists and their communities. Unless otherwise stated, all statements and materials posted on the website, including any statements regarding specific legislation, reflect the views of the individual contributors and not those of Vital Strategies and/or Bloomberg Philanthropies. This year’s FIFA Confederations Cup and next year’s FIFA World Cup™ will be tobacco-free events. FIFA and the Local Organising Committee (LOC) confirmed this on Wednesday 31 May, as World No Tobacco Day is celebrated across the world in conjunction with the World Health Organisation (WHO). This decision is based on FIFA´s long-standing commitment to counter the use of tobacco and its negative impacts, which started in 1986 when FIFA announced it would no longer accept advertising from the tobacco industry. “All our actions in preparing for the tournament are taken in strict compliance with the Sustainability Strategy,” said Milana Verkhunova, Director of Sustainable Development at the Russia 2018 LOC. “One of the objectives in this area is to create a tobacco-free environment at all World Cup stadiums and FIFA Fan Fests. Here, FIFA.com highlights the key dates in FIFA’s work towards smoke-free sporting events. 1986: FIFA announces it will no longer accept advertising from tobacco-industry sponsors. 1999: At the FIFA Women’s World Cup™ in the USA, FIFA supports an anti-smoking campaign launched by the U.S. Department of Health and Human Services (HHS). 2002: FIFA supports a smoke-free campaign launched by WHO and the HHS. World football’s governing body is consequently bestowed with the WHO Director General’s Award for an anti-smoking campaign. 2002: Korea/Japan becomes the first smoke-free FIFA World Cup, meaning it has no links whatsoever to tobacco. Every FIFA World Cup since has followed suit. 2010: FIFA, the LOC and other stakeholders develop and adopt the ‘Stadium Code of Conduct’, which describes the applicable measures and policies for stadium visitors and staff, including prohibition of smoking in the stands and around the pitch. 2011: FIFA provides input to the European Healthy Stadia Network for policy position and enforcement guidelines for UEFA, concerning a smoke-free UEFA EURO 2012. 2013/2014: The FIFA Confederations Cup and World Cup in Brazil take place as tobacco-free events. 2017/2018: The FIFA Confederations Cup and the FIFA World Cup in Russia will both be tobacco-free events. Dubek, a manufacturer and importer of tobacco products, sued the Health Ministry for showing favouritism by allowing Philip Morris International to skirt advertising restrictions in marketing iQOS, the Jerusalem Post said. Health Minister Ya’acov Litzman reportedly is waiting to see how US regulators deal with the tobacco heating device. In the meantime, iQOS is being sold and marketed without restriction in Israel. In its complaint to the High Court of Justice, Dubek said this discriminated against its tobacco products, which face restrictions, the Post said.